The architecture of the ASUS VG278Q gaming monitor is such that it becomes suitable for rapid pace games. The ASUS VG278Q comes with a 27 inch Full HD gaming display with 1 milliseconds of response time which delivers blur free image and also get rids of smearing. 144Hz refresh rate of ASUS VG278Q gaming monitor provides gentle and effort less gameplay environment. To eradicate and tackle choppy frame set and screen tearing the ASUS VG278Q comes with Adaptive-Sync Free Sync technology. ASUS VG278Q 144hz monitor focuses on features which are suitable for gamers and features which will help the gamer to boost and upgrade its gaming experience. It comes with by default and pre-set display modes in which the visuals get upgraded and enhanced according to the needs of the game. The ASUS VG278Q gaming monitor comes with 27 inch size which is fully HD and gives great picture quality. The response time of 1 millisecond makes it fast. 144Hz refresh rate provides gentle and effortless gameplay environment. It is user friendly in nature. It is highly responsive in nature. A narrow viewing angle is a disadvantage as wide angle view is an essential part of gaming monitor. 3D gear is not included in this. It is not as important feature but still it could have been added. No USB ports which could make the connectivity process more complex. Calibration process may be difficult. 1 millisecond of response time which delivers blur free image but USB ports and a narrow viewing angle makes things tight. The ASUS VG278Q comes with a 27 inch of full high Definition gaming display with 1 milliseconds of response time which delivers blur free image and also get rids of smearing. The refresh rate of 144Hz of ASUS VG278Q gaming monitor provides gentle and effortless gameplay environment. With the VG278Q’s ergonomic, adjustable stand and Eye Care Technology gamer can go for long gaming duration. ASUS VG278Q comes with 1 millisecond of response time which delivers blur free image and also get rids of smearing. This rapid 1 millisecond response time helps in games which fast paced and helps in performing well in games like PUBG in which there is very less time or gamer to react and shoot the enemy. The Low Motion Blur Technology of ASUS makes the items in the motion looks more detailed and expressive. The refresh rate of 144Hz of ASUS VG278Q makes the display lag free. ASUS VG278Q Adaptive-Sync Free Sync technology knocks out screen tearing. ASUS VG278Q also provides Game Fast Input Technology which reduces the input lag which makes it efficient. ASUS VG278Q comes with different game centric features which enhances the gamer experience and makes the game more realistic. One of the features is its unique Game Plus technology. In this unique Game Plus technology feature the ASUS provides a hotkey, this hot key intensify the gaming environment and gamer will get a smooth gaming environment. This feature was developed after the feedbacks of professional gamers and ASUS developed this which allows the gamer to practice and enhance their skills. By default display modes are provided. In this by default display modes the gamer can use the default display settings according to the needs of the game. For a mesmerizing and all round gaming experience it has 1 cm bezel. In ASUS VG278Q Flicker-Free technology the gaming experience becomes more appropriate and convenient. This technology cut downs the flickers with which the display becomes smoother. It also reduces the stress and strain of caused by long gaming period. In ASUS VG278Q super low Blue Light technology the blue light which is originated from the monitor is decreased and the effect caused by this blue light also diminished. In this the gamer can select from different in built filter setting according to the needs of the game and gamer. Should you buy ASUS VG278Q? ASUS VG278Q gaming monitor comes with a smart cable management design which is placed on the stand which hides the cables and makes it look uncompleted and in well-kept order. Its ergonomically drafted stand lets the gamer adjust the height, angle etc. according to its suitable viewing angle which makes stand flexible in nature. Game centric features makes ASUS VG278Q gaming monitor a go to product at this price range and size. 3D gear is not included in this. It is not as important feature but still it could have been added which gives more reason to buy this product. The Flicker-Free and Ultra-Low Blue Light technology reduces the eyes strain and stress related problems. 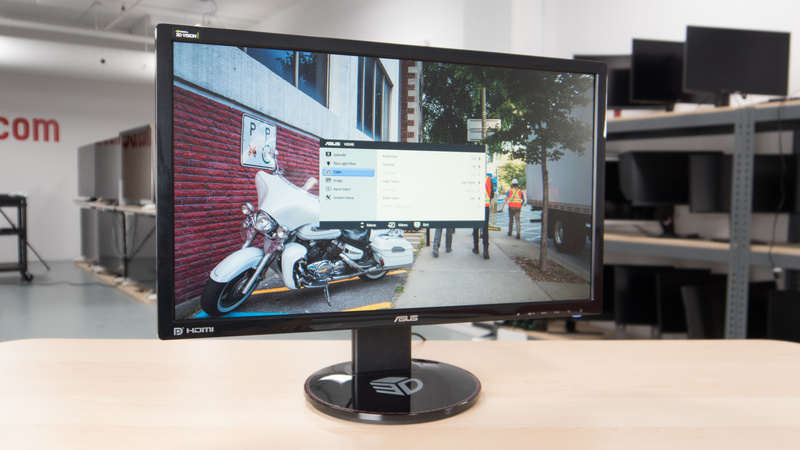 ASUS VG278Q gaming monitor gives 144Hz refresh rate which makes the display lag free. This 27-inch 144hz gaming monitor with game centric features provides better gaming experience to the gamers. 1 millisecond of response time which delivers blur free image and also get rids of smearing is a high end feature. 144Hz refresh rate of ASUS VG278Q makes the display lag free. For the price point though, there are better options available in the market.